Snyder here is imagining life as a difficult hike up and down hills (“the steep climb / of everything”), and the advice is meant to carry the next generation through to until they, we, reach that easy pasture “in the next century / or the one beyond that” – or, in other words, always and always ahead of us. It’s a lovely metaphor, life as a somewhat dangerous hike through the wild: a reminder not to let those in your group, howsoever you determine that group, get separated and lost, nor to go off on your own without their support; to be observant and respectful of your immediate environment, even to the smallest and least consequential element; to be alert to beauty; to not overburden yourself, as it is the journey that is the thing, not whatever you drag along with you. And I’ve always treated it as a metaphor, and not as literal. I do not, honestly, know the flowers. And now the flowers are everywhere. Last month I decided that I would familiarize myself with the flowers, and to do that I would document them by photographing them. The process of documenting them has become rigorous and even obsessive, as I’m determined to record every kind of flower I can find in the fields. 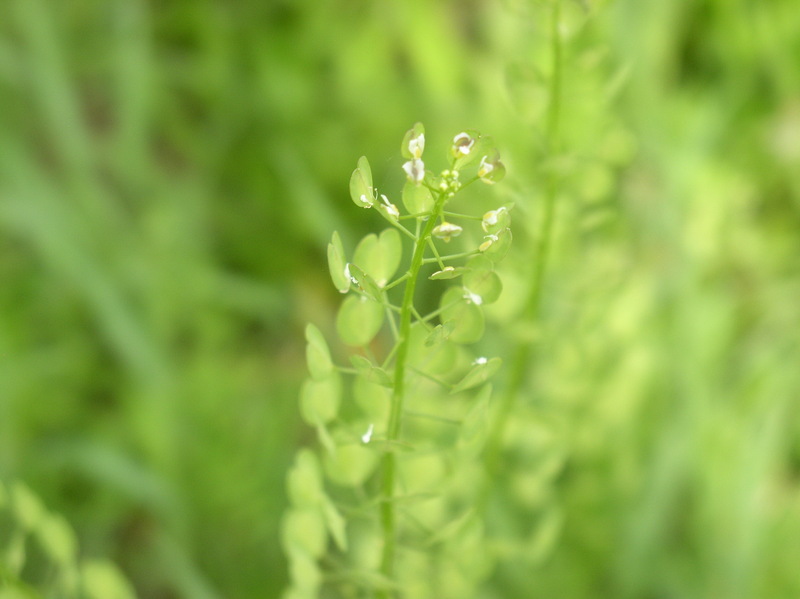 Eventually I imagine I’ll want to identify them, but that’s slow and tentative work, and flowers last only so long. For now, it’s enough for me that I’ve documented them. So I started even before the trees fully unfurled their leaves, when days were still a little cool and damp, mostly, and that is when wildflowers were suddenly blossoming everywhere. The fields and woods are hardly fixed, even within each season, and even within each month, so every day must present an entirely new mixture of buds and blossoms. There are many I missed before I started, and there are many that have blossomed and disappeared in the ensuing intervals between walks. 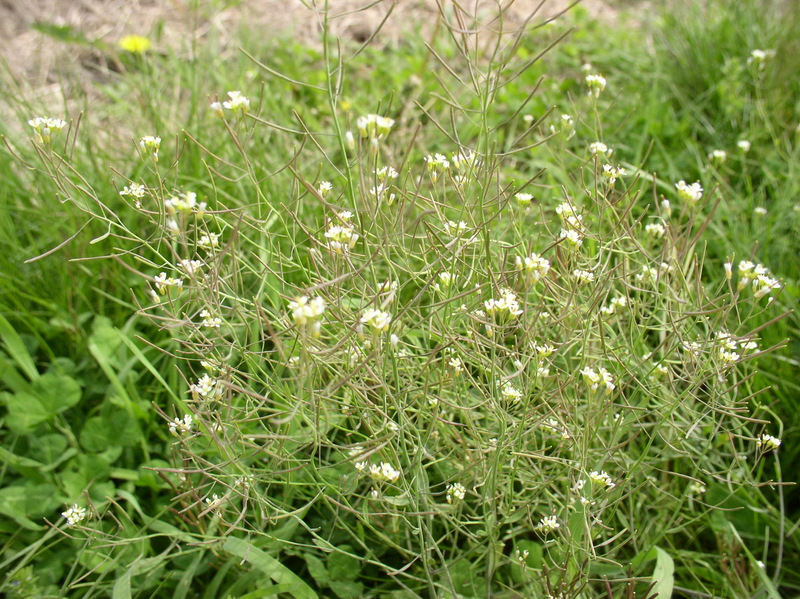 Some plants seem to blossom all summer, and some only for a few days. So a part of my unfolding obsession is to document them as a progression – month by month for now, with the recognition that this will be a project that takes up a couple years, because not only did I entirely miss some of my favorites, like the blossoms of the locust, which I caught just putting out its leaves only a few weeks ago, and a towering purple flower that resembles wild phlox, but I’m also not entirely successful in capturing the images. My equipment, a digital point-and-shoot equipped with a macro lens, has its limitations, but even more limited are my capabilities as a photographer. A number of times I’ve been unable to get a decent picture and have been unable to find the flower again. 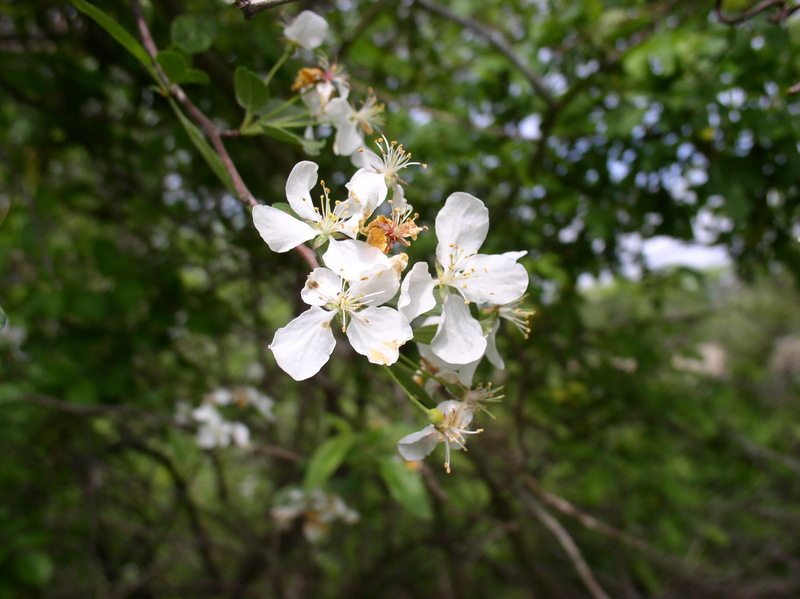 The progress that’s easily observed includes the flowers that I do know, and can be used to place a moment in spring’s progress: our moment on the farm the week I began recording is when the rambler rose, or multiflora rose, is in full bloom, just starting to fade, to be followed quickly by the honeysuckle. 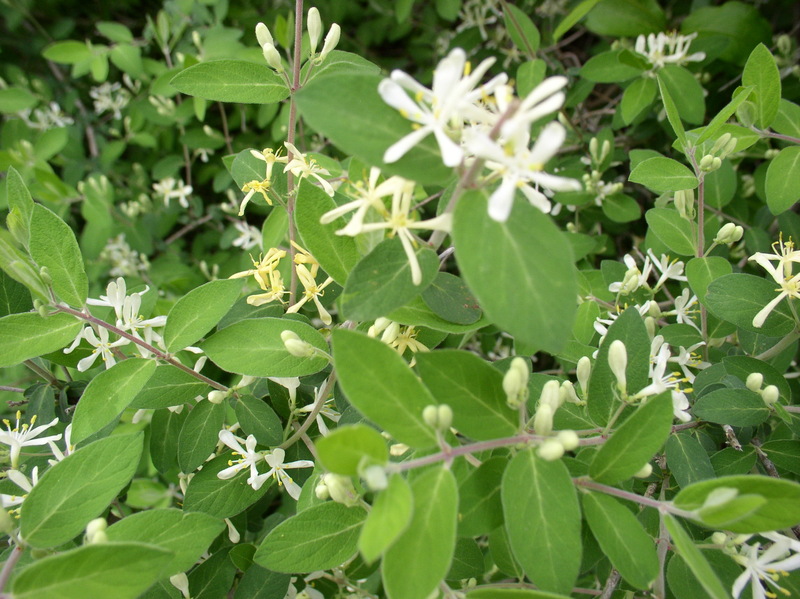 Both the rambler rose and the honeysuckle are considered noxious pests of course – invasive species of the most insistent and ineradicable kind – by people who make some effort to police a yard or garden, but I’m not one of those, so I can enjoy them. But it does raise some issues of mission and classification. 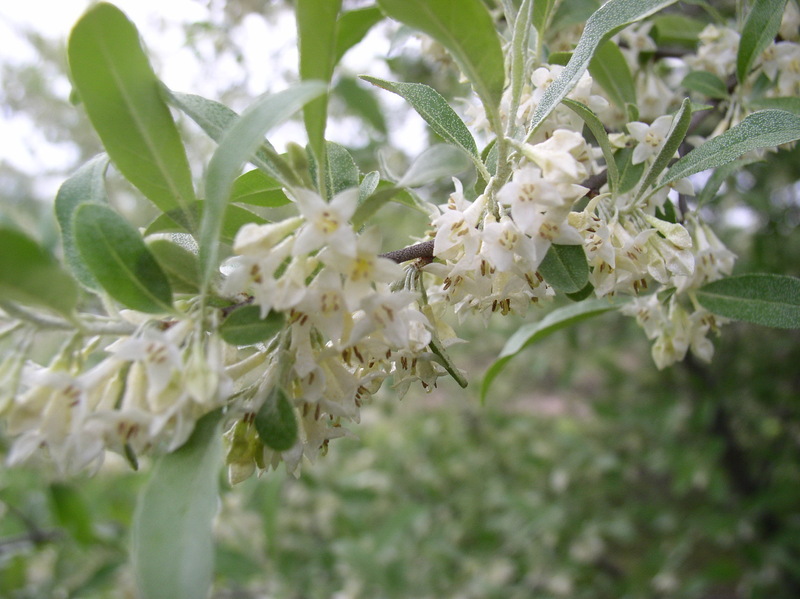 Although they’re exiles from cultivation, neither are they technically wildflowers, by which people mean, almost exclusively, native plants. Although I have some familiarity with these obvious bushes, I can’t really make, and I don’t want to make, the distinction between what is properly here and what is not – between what is desirably here and what is not. Potentially adding to this complexity is that I am recording the flowers of fields that have been cultivated for hundreds of years that have now gone wild for a couple years, and there are a number of things that were clearly planted as decorative hedgerows, like this mysterious bush that is everywhere out there blooming in early spring. But my main interest is the smaller blossoms, the ones that I see everywhere in profusion, like these dramatic tall stalks of aggressively simple white flowers that appear everywhere in the shade for a few weeks. 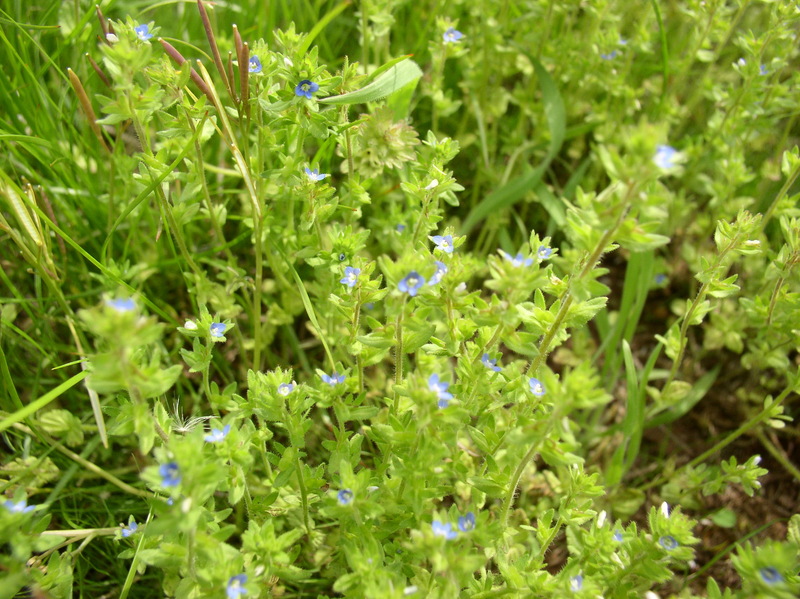 Or these small blue flowers that show up with the new-sprouting grass. And I don’t want to neglect those quotidian blossoms like dandelion and clover just because there’s never anything remarkable about seeing them. In a way, it’s hard to see them because they don’t press upon my documentary project as discoveries, so I have to remind myself to record them. 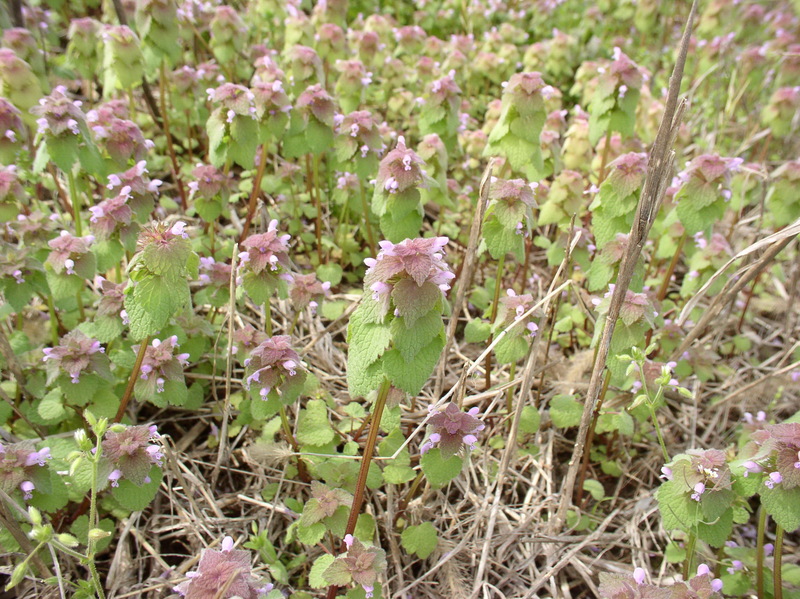 Out in the fields, the first flowers tend to be rather small and delicate, whether they grow heavily and closely clumped like the dead nettle immediately below or in isolated clumps like those that follow after. The most obvious and dominant is what I believe is an early-flowering goldenrod. It seems to be everywhere in May, partly because there’s little competition for attention but also because of its vibrancy. It lasts quite a while, but only because its blooms are so dense and heavy. It quickly loses much of them, and yet still has so many to spare. It holds on to these last few so long that it seems to become an entirely different plant. There are other superstars waiting for their turn, though, as one of the other dominant features of any open field this time of year is the rapidly growing mullein. 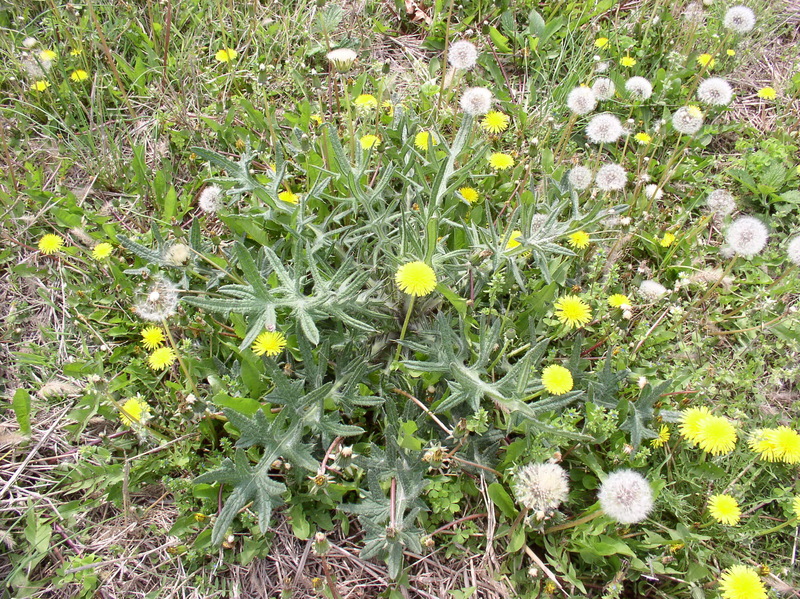 Another invasive species, they and thistle will be the largest and most obvious flowering plants throughout the growing season in any uncultivated pasture or field. 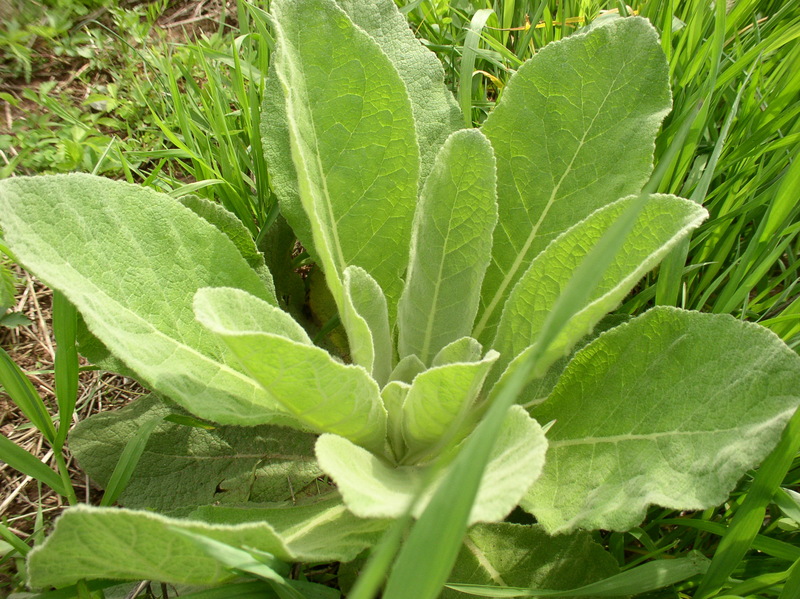 Although the mullein isn’t particularly large or in blossom yet, as most of the ground is still bare, clumps of their large, fuzzy leaves are everywhere visible gathering their power. 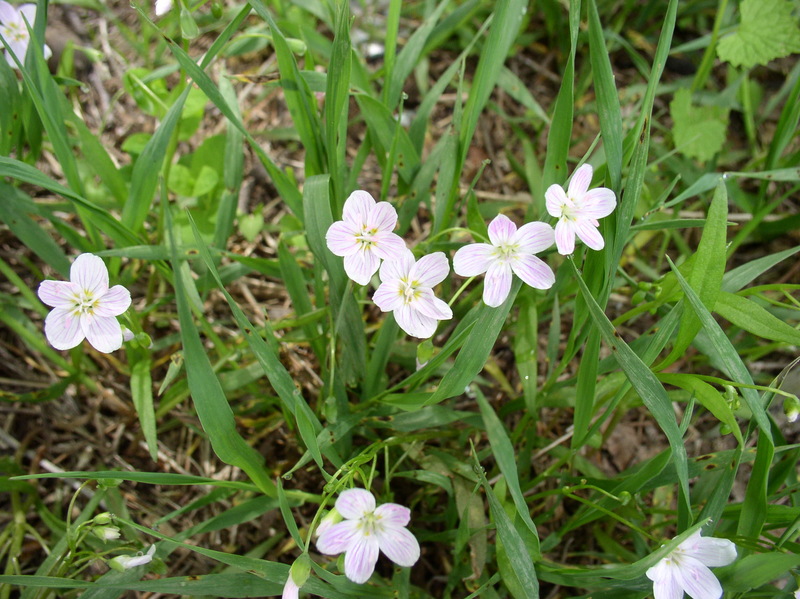 Most of the smaller flowers are completely unknown to me, though there are some perpetual favorites, like the spring beauties. 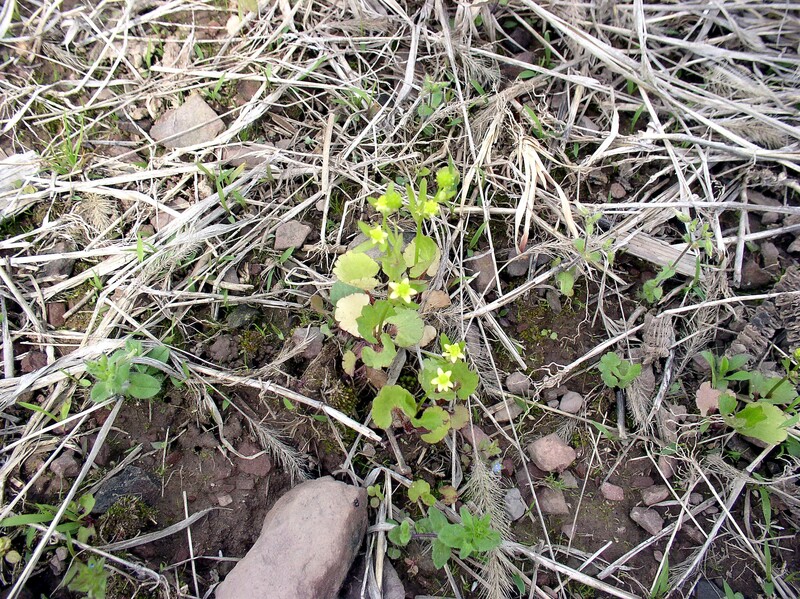 These grow out of the way, in the shadier edges of the field that are being reclaimed by the forest understory. 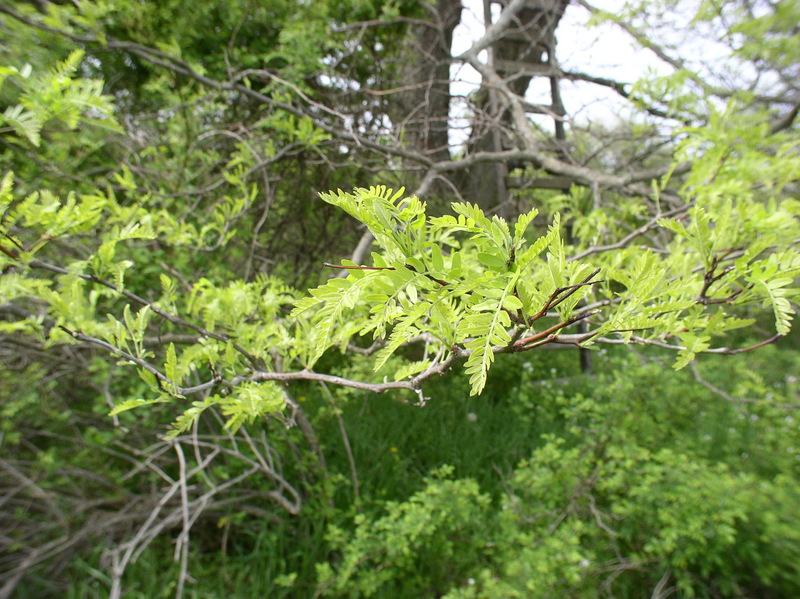 And by restricting myself to the fields, which is a restriction not by choice so much by walking habits, I’m omitting other familiar favorites of the early spring that are found under tree cover, such as mayflowers and jack-in-the-pulpit. Out in the field, others may be familiar but their names and provenances unknown. What becomes apparent to me as I begin walking out with a specific mind to record and document the flowers is that there are many with which I have a long passing acquaintance but until now haven’t shaken out of my general awareness into a singular existence. Not until now. 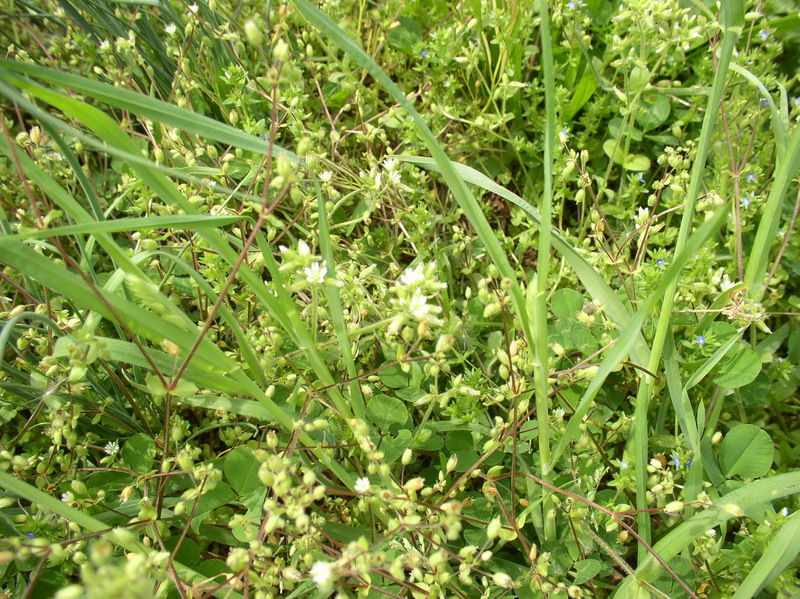 These tend to be grassy plants with small innocuous white blossoms that I could certainly be forgiven for not noticing much before. Some of the flowers I find seem simply part of the tangle of new undergrowth until a new deliberate quality to my attention causes me to notice the blossoms. And some I see I am sure for the first time because of my alertness, desire, and the demands my obsession places on both. Flowers appear where I never saw them before, and plants that I’d never given a moment’s mind to become important, requiring effort on my part to document them, an effort which grows actually in inverse proportion to the flower’s size. 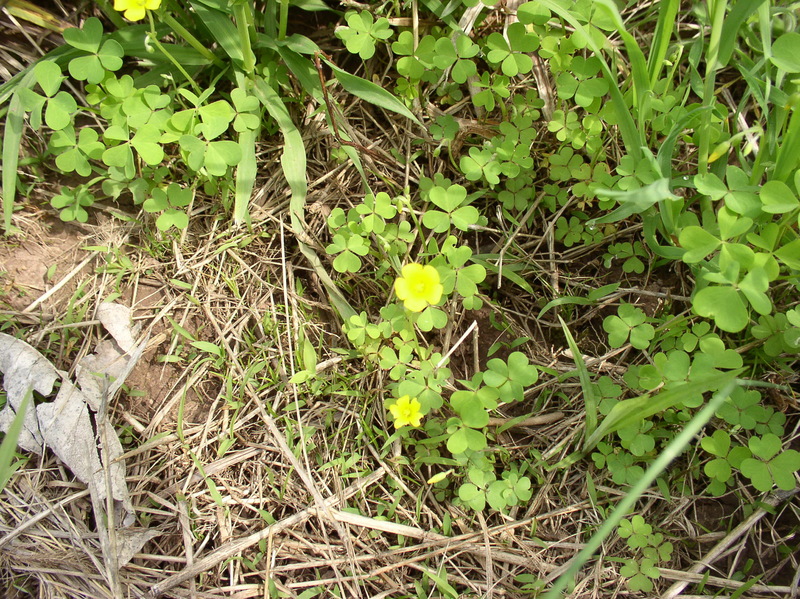 Some of those flowers are tiny and very hard to capture on camera. And it’s those moment when my attention and sometime my entire body are pressed close to the ground searching for another flower to record, that I stumble on these small brief moments of truly incredible beauty like a wild violet. 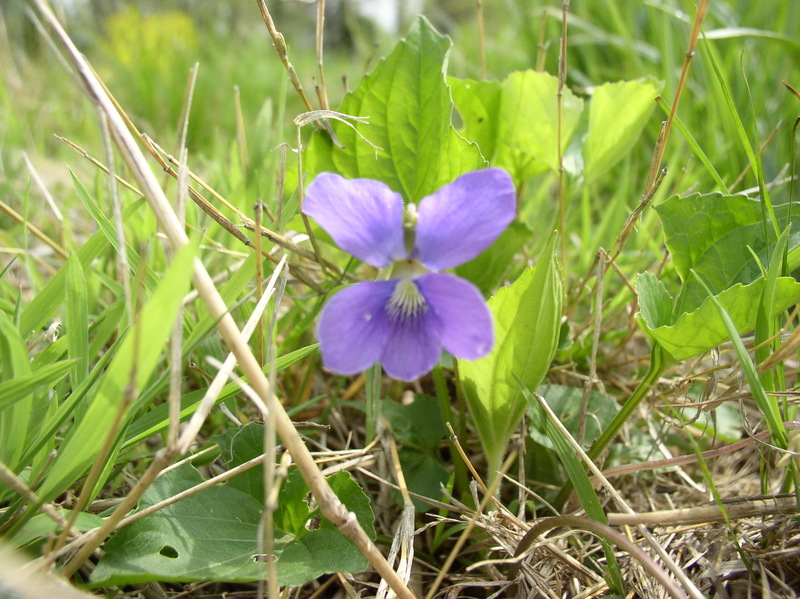 The violets linger for a while in the woods, and I imagine are much more common. In the fields they’re very brief and all the more precious for being so unexpected. I appreciate these discoveries for what they bring me, but what fascinates me still more is the quality of attention that gets cultivated. I find many more flowers each walk than I expect, and I find so many more on my way back than I do on the way out. My awareness grows both in intensity and in breadth, picking things out I’ve never paid much mind to before but also throwing familiar surroundings into a more detailed relief. There’s also that sense of responsibility that won’t let me not photograph a flower once I’ve found it and drives me back into the field when I discover that the photograph didn’t take. It comes from the same drive to completion that I imagine motivates collectors, but for me it’s a drive to describe in as fine a grain as I can a process in which I am already implicated by being here, but only in a fragile and inconsequential sense. It’s not really full knowledge, I suppose, at least not that of a wildlife botanist, but it’s true knowledge enough, which has at its basis as it always does something of the habitual and obsessive, and is founded upon the memory of a physical act and a conscious act of memorialization. And by it something that is fleeting and otherwise only noticed in passing becomes, I hope, more meaningful. A nice flower roundup! 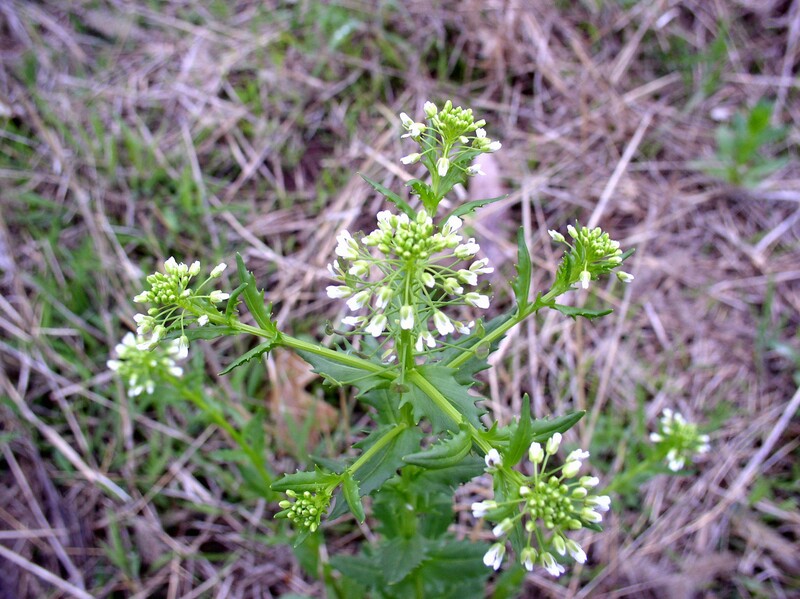 The white 4-petaled flower with the toothed leaves looks like garlic mustard, an invasive species that I see a good amount of in Ohio. May seems to be its big month for blooming. I like your blog, I’ll be back! 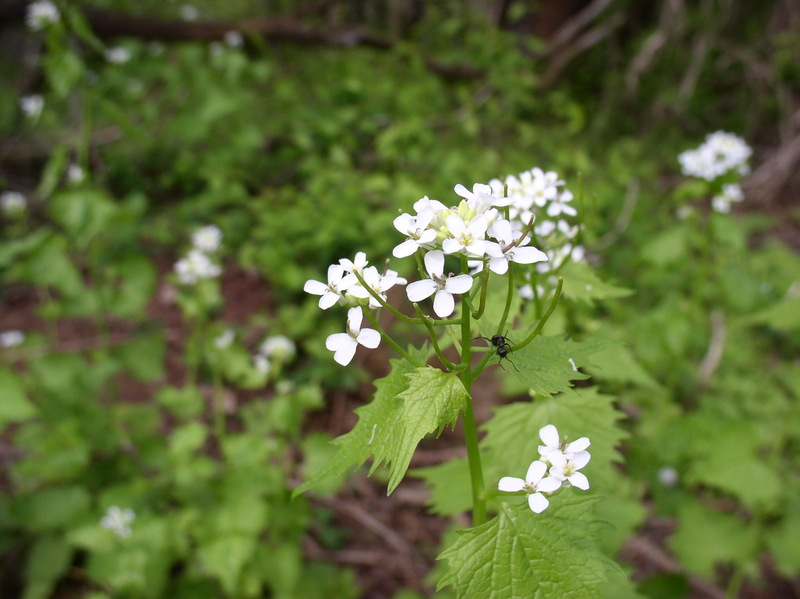 Garlic mustard! Yes, that’s it. That’s one that’s been pointed out to be before, but this time I should remember it. 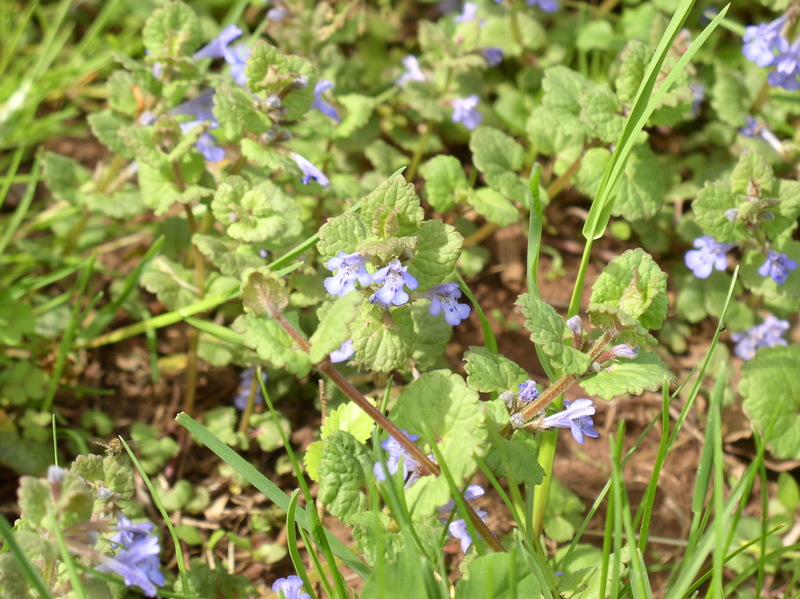 Especially love those small blue hedgemaids beneath the aggresive garlic mustard. Blue hedgemaids! Thank you. I love them, and tend to mow around them in the yard when they’re around. And thanks for accepting my ignorance. By next year, I expect I’ll have a nodding acquaintance with the common names of the more familiar flowers, but I’m not letting my lack of knowledge interfere with my desire to write about them now obviously. I don’t believe that the flowers you refer to as early-blooming goldenrod are goldenrod, though I can’t suggest what they might be. Yes, isn’t that just it? 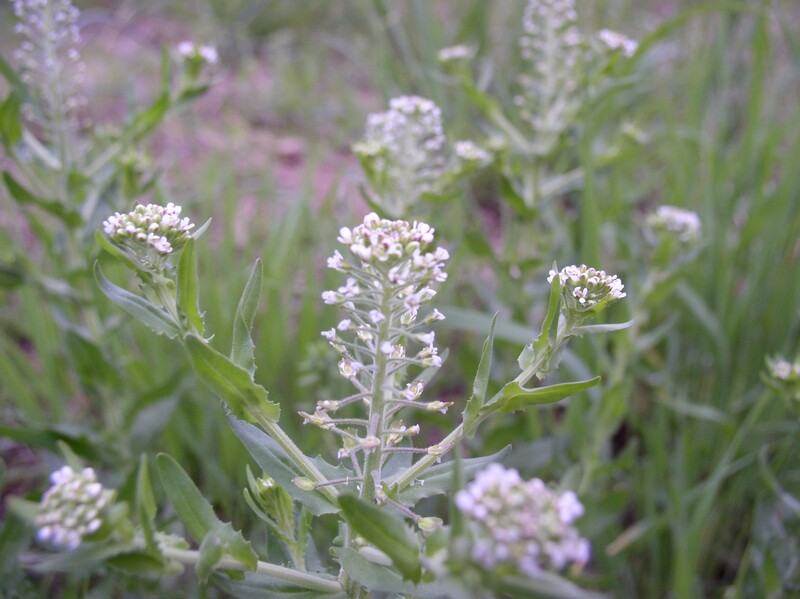 It’s obviously not goldenrod goldenrod, which we don’t have yet and will in multitudes by August (my son likes looking for the little yellow crab spiders that live in the flowers). And I’ve been scanning wildflower identification pages online with no luck, which is weird because that stuff was everywhere a few weeks ago. 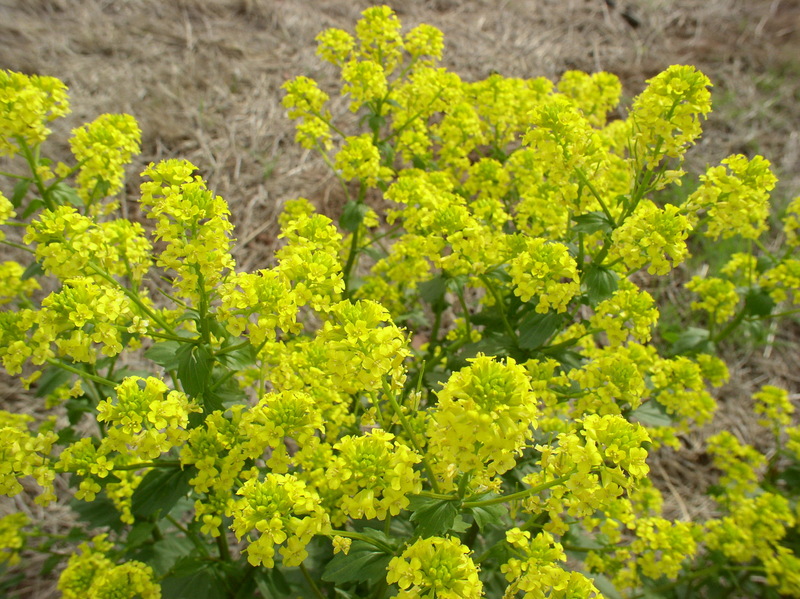 And everybody around here just calls it goldenrod. It’s really kind of a scandal that I don’t even have a decent field guide for this yet. That’s the first thing I tell my students to do if they’re going to write about nature. Here in Austin we have several good guides. Good luck on finding one for your part of New Jersey. 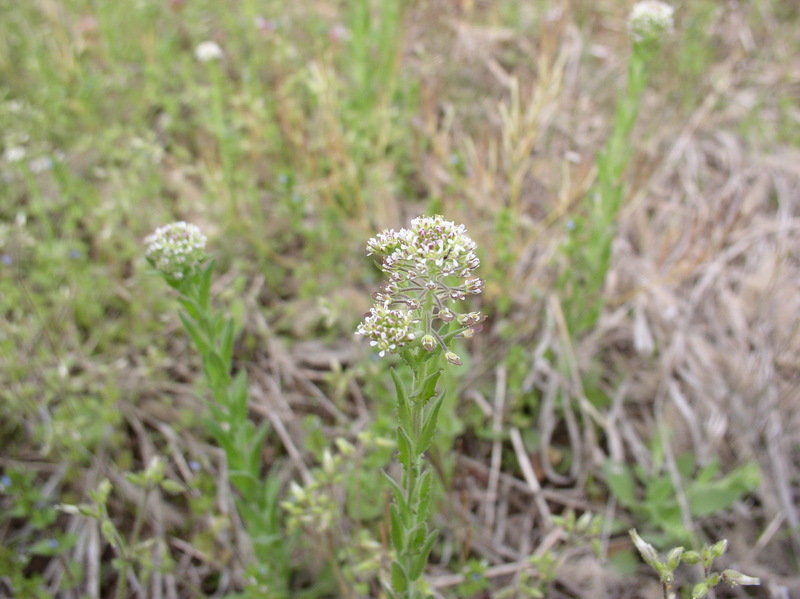 Those “early blooming goldenrod” might be wintercress. 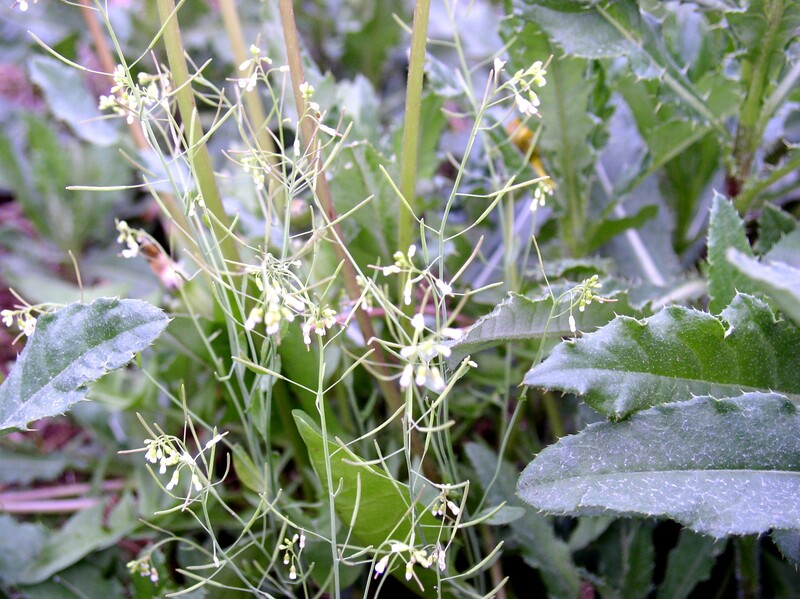 If not, maybe black mustard? I’m on the PA side of the Delaware, just south of Philly. The Audubon Field Guide to Wildflowers, Eastern Region really comes in handy for me. Thanks, neighbor, for the recommendation. I actually went with a new field guide put out by the National Wildlife Federation – either they’ve just begun issuing a line of field guides or I just haven’t noticed them before. It’s nation – or continent – wide rather than regional, but I like the fact that the descriptions are on the same page as the color photograph. AND I saw that Sibley now has a field guide on trees done up just like his bird guide, and so now I’ve added that one to my must-get list. 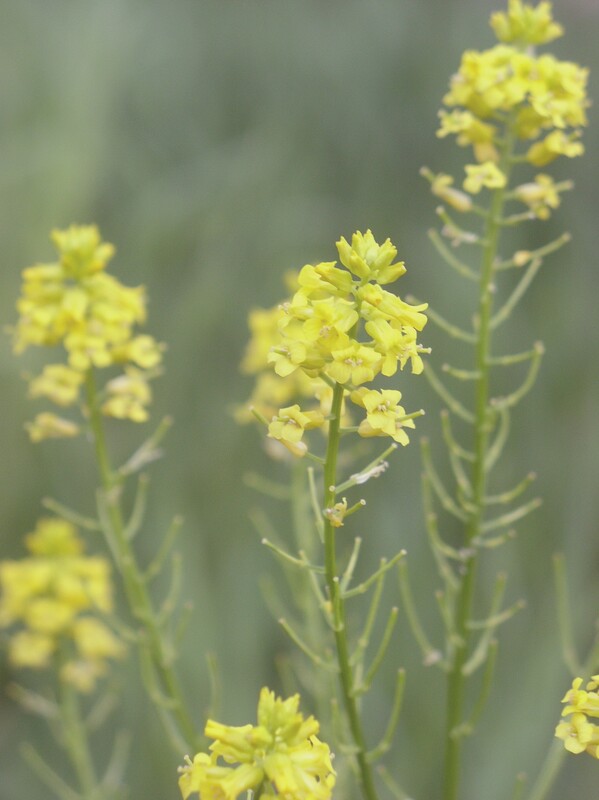 And I think you’re right about that golden-rod-like flower being a mustard, and probably black mustard. I’ll have to look further into it. Oh yeah, Sibley is absolutely my favorite field guide to trees. Somehow his illustrations are more useful than photographic texts. It’s on my wish-to-own list, too. For now, I rely heavily on the public library!